I’m sitting at the breakfast table at Inn on Lake Granbury trying not to over-indulge. Problem is there’s an abundance of food, and it’s all worthy of five stars. Cathy Casey, owner and chef, has prepared a fabulous spread of her delicious mixed berry bread pudding, Southwestern hominy, scrambled eggs, bacon, and a generous fresh fruit salad. 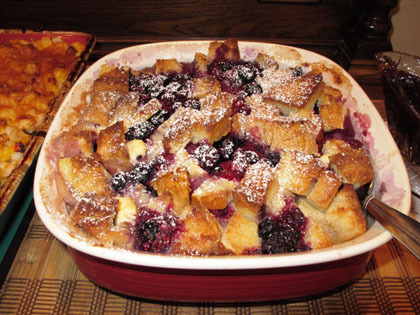 And tomorrow Casey plans to serve her specialty, upside down banana walnut French toast, with sweet and savory eggs and peach cobbler. I simply can’t turn anything down. 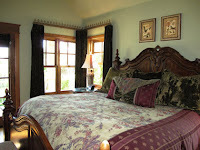 Since arriving a day ago, we’ve come to expect such indulgences at the Inn, one of Granbury, Texas’ finest accommodations. Spectacular grounds overlooking 300 feet of lakefront are the perfect backdrop for 15 rooms, suites, and guest houses. Brides have discovered the setting, too; so Casey, as full-service wedding planner and caterer, hosted 63 weddings on the property in 2012. That’s an indication of how successful the Inn has become—with a lot of hard work from the owners. Living in California when 9/11 occurred, Casey and her husband Jim Leitch were ready for a career change that involved less travel and more family. They looked at properties for two years before purchasing the house and moving to Granbury in June 2003 to start their bed and breakfast. The couple completely gutted the house and rebuilt it inside and out. They replaced the pool and added more decking. 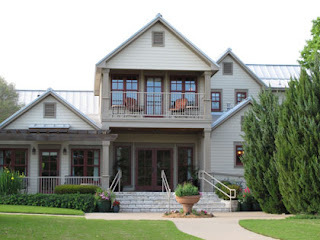 The main house was decorated in an old-world style that’s elegant without being fussy. Newer loft accommodations are more contemporary and decorated with art work from a local, nationally-known artist. The glass-walled Lake House enjoys unobstructed views of the Granbury Lake. Under their guidance, this renovation process earned the property acclaim as a Distinguished Inn of North America by the Select Registry. 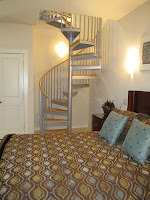 All rooms have flat-screen TVs with cable, DVD players, and iPod/ iPhone docking stations. Wi-fi is available through the Inn. Some rooms have fireplaces and others have balconies or porches. The bathroom in the Brazos rooms where we're staying has a steam shower, which we try out one night. 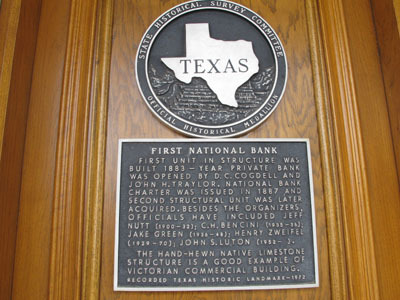 Across the hall is John St. Helen room, the name John Wilkes Boothe, assassinator of President Lincoln, took when he spent time in Granbury. Groups using the conference facility have the opportunity for fresh air experiences when strolling paths along the Inn’s gardens and lakefront. One evening, hubby and I sit in the lake-facing tree swing, watching motor boats and kayakers go by. Sam, the resident cat, hops up and makes himself comfortable in Larry’s lap. Late afternoon drinks and appetizers are provided each day in the main building for overnight guests, and a continental breakfast of pastries and juice is laid out each morning—teasers for the full gourmet breakfast served around 9:00 a.m. 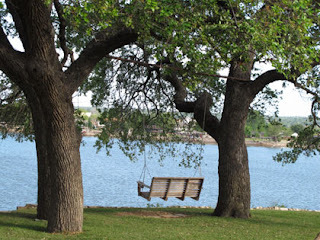 The Inn at Lake Granbury is located just a short walk from the Granbury Square and historic district. We stayed at the Inn while attending the annual Wine Walk festival in April, but numerous special events are held throughout the year. Check the web site www.granburytx.com for specific information and dates to plan your visit. Or just come whenver you feel the need for a getaway. Located 40 minutes from Fort Worth and less than three hours from Austin, Granbury is a fun and friendly town. It's rich in frontier folklore and Texas history and has a good variety of shopping and dining options. Park your car at the Inn and walk to most notable sites. Take time to relax by the pool or lake when you stay at the Inn on Lake Grabury. But bring a hearty appetite--in this B and B, the bed is perfectly comfortable, but the breakfast simply excels.